I’ve talked about Parke Godwin as a person before, but now I’m going to concentrate on his legacy a bit. He tried out science fiction a bit (see The Masters of Solitude written with Marvin Kaye) but he really hit his stride with historical fantasy. I rank his take on the Matter of Britain at the very least in a league with Rosemary Sutcliff’s, and I do not say that lightly. My first exposure to this area of his work was The Last Rainbow, a take on the legend of St. Patrick, a subject I didn’t think I cared a whit about until I read his version. Parke Godwin came from a theatrical background (he was an actor long before he became a writer) and you see it in the care that goes into the creation of every one of his characters. They are never around just to serve the plot, a failing you’ll often run into even in the best of other author’s work. Each and every one has, for want of a more appropriate term, stage presence. If a tinker shows up on page 234 for one scene only, you can bet he has a backstory, his own reasons for being where he is, and you’re likely to remember him when the book is done. There are no throwaway characters in a Parke Godwin Book. Next up is Firelord. This is the beginning of the diptych of Godwin’s take on the legend of King Arthur. If I had to single out any one book as Parke Godwin’s masterpiece, this would proabably be it. Godwin’s take on the story of King Arthur takes him from Celtic tribal prince to a soldier in the last days of the Roman Empire’s influence in Britain to war commander to king. The fantasy element is always slight enough that one could ignore it, up to a point, but it’s there in a way that makes sense. Even Merlin plays his part, though he’s not who you might think he is. It’s a unique take on the legend, and I’m not giving any more away, so read it yourself, if you haven’t already. You’ll note above that I said “probably” his masterpiece. The only reason I’m a bit wishy-washy on that is because I waffle between Firelord and the second book, Beloved Exile. If Firelord is mainly Arthur’s story, then Beloved Exile is Guenivere’s. 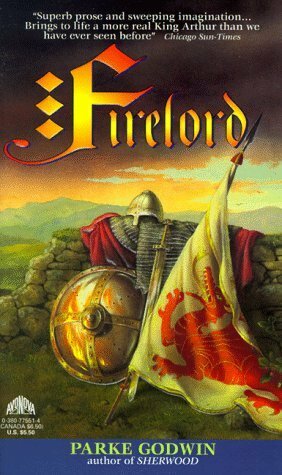 Specifically what happens after Camelot falls, a time period given fairly short shrift by most accounts of the story, maybe because the early tellers saw that as the end, but there are no endings, not really, and there was no way in hell that the Guenivere of Firelord was going to be retiring to a nunnery, then or ever. Which book is my favorite rather depends on what day you ask me. There’s a lot more I could talk about, but then I don’t want to spoil it for anyone just getting into Godwin’s work. I will point out that you don’t want to overlook either Waiting For the Galactic Bus or The Snake Oil Wars, Godwin indulging his comedy chops with the linked stories of two extremely advanced aliens who get “temporarily” stranded on the Earth and the extreme mess they make of the place. There’s his one collection of short stories, The Fire When it Comes, including the World Fantasy Award-winning novella of the same name. There’s Tower of Beowulf. There’s his marvelously off-center take on Robin Hood—Sherwood, and Robin and the King. There’s…well, lots. Unfortunately a great many of these are out of print, but editions are available, and I’d jump on them while they are. You wouldn’t be disappointed by any of them, and if you are, well, we have nothing to discuss. Of course, you can’t discuss Beagle without a mention of The Last Unicorn, the story of a greedy king who imprisons all the unicorns in the world for his own enjoyment, except one, and Schmendrick, the walking trainwreck of a wizard and the world-worn former young maiden who attempt to aid that unicorn on her quest to find and free the others. It’s a novel, and extended metaphor, and a deserved classic. If you think you wouldn’t like this just from my description, you’re only hurting yourself. After somewhat of a hiatus, Beagle re-emerged onto the fantasy scene in a big way just a few years ago, starting with a sort of sequel to The Last Unicorn. The story was “Two Hearts,” a novelette which won both the Hugo and Nebula awards. You can find it in The Line Between, which I’ve already talked about here, so I won’t go into that again, but it does bring us around to Beagle’s story collections. My first Beagle collection, and in some ways still my favorite, is The Fantasy Worlds of Peter Beagle, because it contains two of my all-time favorite novellas by Beagle, “Lila the Werewolf,” and “Come, Lady Death.” In the first, a man discovers that his girlfriend is a werewolf. In another’s hands this might have been a sort of shock/horror thing, but of course Beagle is way too deep a writer for that. It’s what happens after he makes that discovery is the interesting part. Likewise “Come, Lady Death,” is about a high society matron who decides that her upcoming ball simply would not be complete without one very special guest, Death. So she devises a perfectly logical but callous way to invite said august personage. If you’re expecting the result to be Beagle’s take on “The Masque of the Red Death,” think again. And yet it manages to be both beautiful and horrifying anyway. Full props. Really, you can’t go wrong with a Beagle collection. There’s The Rhinoceros Who Quoted Nietzsche and Other Odd Acquaintances, which I talked about here, and We Never Talk About My Brother, any of which would be a good place to start. I’m not sure there is a wrong place.